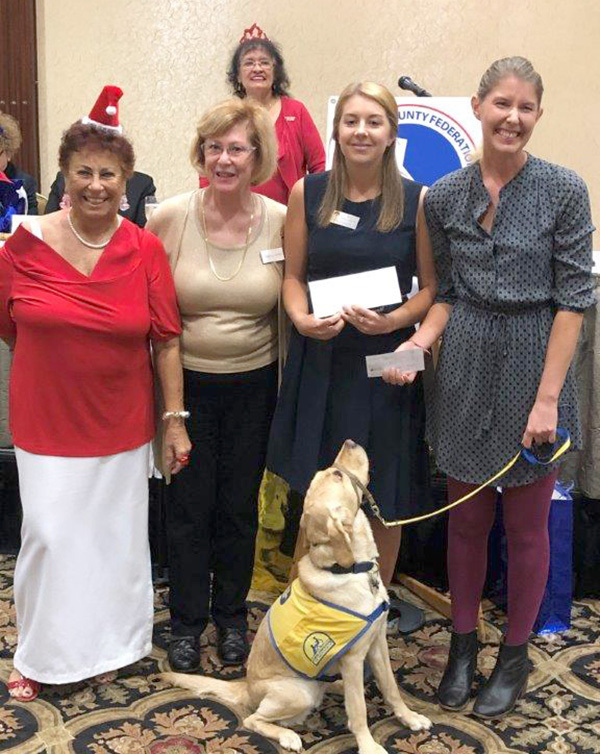 At the December meeting of the San Diego County Republican Women Federated, a check was presented by Terry Casey representing Navajo Canyon Republican Women Federated (NCRWF) to Erin Hoffman and Samantha Williams of Canine Companions for Independence/Oceanside. Those attending were thrilled to meet and greet Norma, one of the many dogs that have been trained, who will soon be assigned to a veteran whose life will be changed by this dog’s devotion and assistance. NCRWF is proud to support this nonprofit organization that unites disabled veterans and others with companion dogs at no charge. We received a touching letter from Kristina expressing her sincerest thanks for the support that NCRWF has given Canine Companions. Her daughter, Emme, was recently paired with Tillman II, a trained Labrador/golden retriever. Emme was diagnosed at a young age with Down syndrome and autism. Kristina shared with us how Emme’s life has been dramatically changed for the better since having Tillman II in her life. Everything from improved speech and social skills, to being less fearful of doctor and hospital visits. They can’t imagine life without Tillman II. The beginning of 2019 also marks the start-up of a new club for Republican women. January will be the launching of Republican Women of California-Navajo Canyon. The goals of the club will remain consistent — and that is to get Republicans elected and focus on making the public aware of what is going on politically in our city, county, state and country. Every month we are working on projects involving volunteers to promote our values and philosophy. Make this the year you get involved and see how rewarding it can be. Graham Ledger was our kick-off speaker on Jan. 8 at the Brigantine in La Mesa. Ledger is well known as a television newsman and is now hosting “The Daily Ledger” on One America News Network. He shared information and his insights into the political world both locally and internationally. Joshua Wilson, executive vice president and media representative for National Border Council Local 161, representing San Diego Sector of Border Patrol Agents (NBPC), will be the speaker at our February meeting. The NBPC organization is concerned with safety for Border Patrol agents and border security for the United States. This is our chance to hear directly from the agency that is protecting our borders and learn what is happening on the ground. San Diego is the busiest U.S. border crossing with Mexico. Please join us Feb. 12 at the Brigantine Restaurant in La Mesa as we hold the second meeting of our newly formed club and learn about our Border Patrol from someone on the inside. There couldn’t be a more pertinent topic for discussion at this time than border security. Check-in begins at 10:30 a.m. for the 11 a.m. meeting. A full course lunch will be served with the speaker to follow. Cost is $25 and reservations are required. Cash and checks are accepted, but sorry, no credit cards. Please RSVP to RSVPrwcnc@gmail.com or call Marjie at 619-990-2791. 2019 promises to be another exciting political year, and 2020 is already an active topic. For more information on our activities, please visit our website at rwcNavajoCanyon.org and check us out on Facebook at Republican Women of California-Navajo Canyon. —Pat Boerner writes on behalf of the Republican Women of California-Navajo Canyon. Reach her at pboerner@cox.net.